I think I watch too much television. This weekly post is a lot to keep up with and I should start reading books instead. APRIL FOOLS. I LOVE Television! She is my second wife, and I am never leaving her! On this chapter of The Queerest Things I Watched Last Week, JR Shot Who is finally revealed on Jane the Virgin. 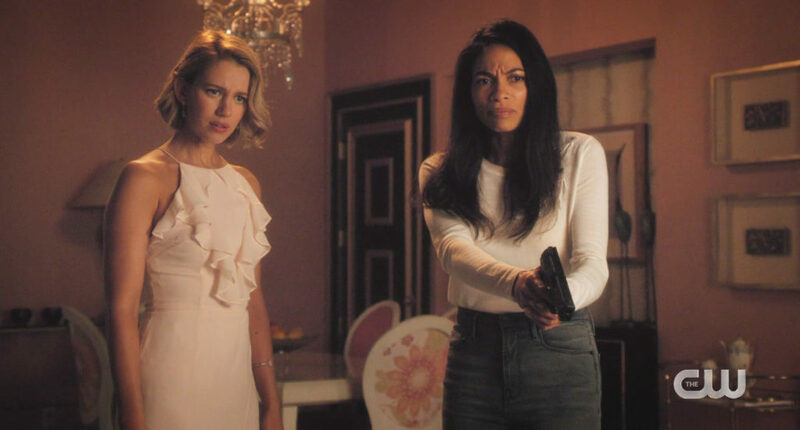 The Alice/Joey/Sumi/Meera drama continues on Good Trouble, and we met Niko’s fiancé, Greta, on Charmed. This episode opens with a meeting between Callie, Jamie, Jazmin and Gael about Jazmin’s discrimination case against the catering company she was working for. Jamie tells her the company is willing to settle for $10,000 if they don’t go to trial. If they do go to trial, it will be long and drawn out, and she may wind up with nothing in the end. Jazmin does not want to settle. Elsewhere, Alice, Joey, Sumi and Meera are having their usual lesbian awkwardness at Gael’s art opening. Hard eyeroll. Even though Sumi is implying she made a mistake with Alice, you know if they actually got back together, she’d be wanting Meera again in five minutes. Also at the art opening, Jazmin tells Gael she’s changed her mind after meeting with the lawyer and now wants to settle. She says the money could help her get back on her feet. That’s too bad, I was ready for a fighting transgender job discrimination plot. Alice is in a room at the gallery watching a video installation when Meera walks in and apologizes for being a jerk to her the other day. She says Sumi is her soulmate, and she gets jealous of her and Alice because they are best friends. Cue the flashback! I have nothing to say about this confession, but Joey sums it up nicely. The spring finale for #GoodTrouble is next week! Will Sumi and Meera get married? I’m landing on no as well. We’ll find out this week! It’s the moment we’ve all been waiting for — the return of Jane the Virgin! While waiting in between seasons for my favorite shows, I’m usually super impatient for the next one to start up again. But since season five is JtV’s last, I almost didn’t want it to start yet. It’s the beginning of the end and that makes me really sad. I did want to find out the answer to #JRShotWho though. But before we got to that, the show explained the other giant reveal from the end of last season: Michael coming back from the dead. Remember when Raf visited Rose in jail? That is when he found out Michael was still alive. Ah, it’s all coming together now! But who is Michael now? Rose electroshock-ed Michael into amnesia! In the flashback scene, Raf demands Rose tell him where Michael is, and she replies she will only tell him if he tells her where Luisa is. I did not have Miloš anywhere on my JR Shot Who list. I actually forgot all about him. At this point I would like to show you all my tweet of predictions I made after the finale last year. JR shot Anezka. This way Petra didn't really kill her in the first place and now they have to deal with JR committing a crime. I nailed the amnesia, but completely missed JR Shot Who. Miloš says he was trying to get revenge for her getting him put in jail. Petra then realizes JR may have saved her life. Petra starts to call the police, but Miloš tries to stop her by saying he owns two thirds of the Marbella because he scammed Luisa into donating shares to him while she thought she was contributing to a Save The Ferrets non-profit. He says if Petra lets him go, he’ll give the shares to her. Petra seems to hesitate for a second, and JR is appalled. She’s like, “This guy just tried to kill us and you’re considering his offer?” She says the fact that she hesitated is the reason she can’t be with her. After they argue about this for a minute, they turn back to Miloš, and he is gone. Petra and JR go to the police station to report him, and after they’re done, JR goes to walk away. UGH, I hate seeing Petra so sad. I love them so much I want them to telenovela make up already. Meanwhile, Luisa calls Raf because Rose has made contact with her in the form of hundreds of vegan donuts after Raf gave up her location in return for Michael’s. So Rose will only explain why she fake-deathed Michael and gave him amnesia if Luisa visits her in prison. Y’all, I know Rose and Luisa are the most dysfunctional, drama-filled couple on television, but I don’t care. This is a telenovela where we are free from the constraints abiding by a healthy reality, and I want them to end up together. I hope we get to see Luisa visit Rose next week! Back at Petra’s apartment, she finds Miloš with infected gunshot wounds hiding in a giant stuffed bear. Miloš tells Petra he’ll sign the shares of The Marbella over if she gives him antibiotics and lets him go. She accepts his offer and makes him put it in writing. At this point we’re led to believe that Petra hasn’t changed, but soon we learn it was just a stalling tactic so he would stay put until the cops came to arrest him. She also puts in last-minute a dig before he’s taken away and lets him know it was not the lesbian thing at all. I love it when bisexual characters say The B Word out loud! At the end of the episode, JR runs into Petra at her apartment when she’s there to get her stuff, and Petra makes a plea to give her another chance. I have faith JR and Petra will get back together because on a telenovela you can lie to your girlfriend about murdering your sister and she will eventually forgive you. But I hope we don’t have to wait for too many episodes for it to happen because this is the last season, and I don’t want to spend too much of it in Petramos angst. Niko texts Mel out of the blue because she wants her to come over to talk. Her sisters dissuade her, but in the next scene we see her at Niko’s doorstep. The door opens and we meet Niko’s fiancé, Greta, for the first time! I’m not gonna lie, I think Greta’s cute. And I love the addition of a new queer character to this show! Niko has a woman named Scarlet at her house who has escaped from a cult, and she thinks the Sarcana may be involved. Mel insists the Sarcana has nothing to do with it, and she makes a little slip as well. Oopsie! Mel says she’s gotta go and jets out of there. She visits Jada to see if Fiona can help Harry who had his powers taken away by the Elders. Jada says Fiona is too busy, and there’s nothing she can do to help Harry. The Keeper (Fiona) is her only priority right now, and how she and Mel feel about each other does not change that. She also says Mel should understand because she’s one of the Sarcana. And that’s it, Mel breaks up with her. For now. The sisters look into the cult thing and figure out it’s led by a soul-sucking demon played by Caleb from Pretty Little Liars. Maggie tried to go undercover but accidentally gets sucked into the cult for real. Maggie and Macy figure out where she’s located and go there to rescue her, but run into Niko who is also on the case. Mel stops time, she and Macy rescue Maggie, kill demon Caleb and everything is easily resolved when Mel unfreezes Niko again. Niko is going to catch on soon. Also, what will happen with Jada and Mel? We’ll have to wait a few weeks to find out. Tonight – Legends of Tomorrow is back! I’m so happy to see my favorite time-traveling heroes on TV again.